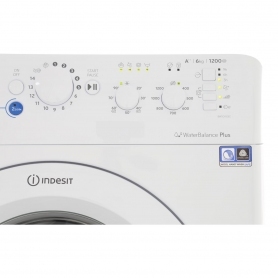 Save water, time and energy with the Indesit BWSC61252W Washing Machine. 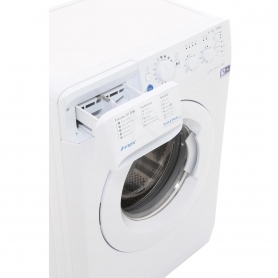 The appliance has a wide range of cycles including the advanced Push & Wash programme. It cleans and removes stains from clothes in just 50 minutes and there is no need for items to be pre-treated. With programmes dedicated to sportswear, dark materials and shoes, it is designed to protect, remove strong odours and eliminate dirt from complex materials. 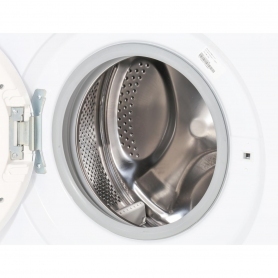 Should you run out of time during a cycle there is a rapid 30-minutes programme to speed up your washing cycle. Depending on the type of programme that has been selected, the Water Balance Plus technology adapts how much water is used. This ensures that your water consumption is kept to a minimum, saving you money on energy bills. Remove stains in just 50 minutes with the Push & Wash programme. Has a capacity load of 6kg. An A++ energy efficiency class which helps to reduce household bills. 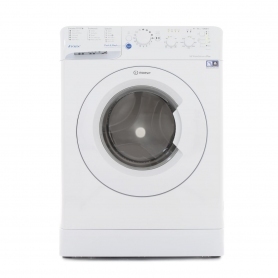 A delay timer enables washing to be done at time that suits you. It has a convenient LED display.